Get ready ladies and gentlemen, the world’s greatest metalcore band is coming to the Stage AE on Tuesday 17th October 2017!! That’s right, it’s Motionless In White, on tour with their brand new album, “Graveyard Shift”. Accompanied by The Amity Affliction & Miss May I, they’re on their way to the Stage AE for a mindblowing show you will never forget!! 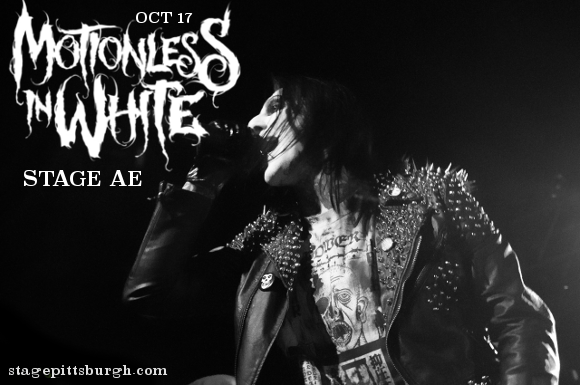 Don’t miss out – get your tickets to see Motionless In White NOW while tickets last!! Known for their captivatingly powerful music and aggressive, high-energy live shows, Motionless In White formed in 2005, and were promptly signed to Fearless Records for their first three highly successful albums. 3 years since their last album in 2014, the band have now released their 4th studio album, “Graveyard Shift,” their first with Roadrunner Records. "We wanted to really have a title that we felt not just represented us but was less of an acknowledgment of our own accomplishments and more just a dedication to people who we feel are similar to us in that we work hard and that we give everything that we have to survive or chase our dreams,” Chris Motionless explained, regarding the new album’s title. This theme couldn’t be more evident than in the video for “570,” the first single from the new album, in which the band perform amongst an audience of their fans. Be among the first to hear all the brand new songs live – book your tickets to see Motionless In White live today!! Hurry, tickets won’t last long! !